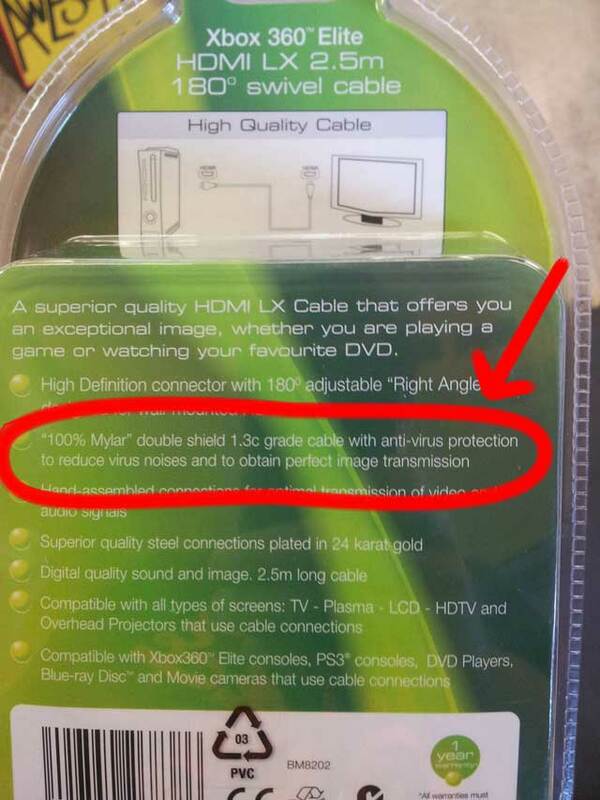 We’d like to believe that the packaging for this HDMI cable is the victim of poor translation or some kind of misunderstanding. We sincerely hope that no one working in the consumer electronics industry believes that digital video is susceptible to viruses, those viruses cause noises, and that you can fend them off with a nice coating of Mylar. But we’ve had to deal with the public, and know better. A reader kindly sent this photo to our estranged ex-cousins over at Gizmodo. This is an HDMI cable marketed to go along with an Xbox. Okay. You don’t need a special cable for an Xbox, but we’ll let that go. The real problem is on the back of the package, where the made-up boasts begin. I miss Monster Cable. They probably wish that they had thought of this antivirus cable idea first.